Bread is the most common baked product, available all over the world, in some form or the other. Some are leavened, others are unleavened. The glycemic index of white bread is 71 which falls under high GI category. Since it is made up of refined flour, it is not that great to consume bread in daily routine. Is White bread safe for diabetics? No, white bread is not recommended for diabetics. Around 21 grams of simple carbohydrates is found in just 2 slice of bread (approx. 40 grams) which is easily converted into glucose and released into the blood stream and fluctuate your blood sugar levels rapidly. This makes the glycemic load of white bread 14.5 which is medium. Moreover white breads are processed and all we get out of it is junk for our body. 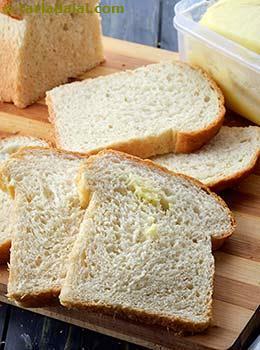 The fiber levels in white bread is negligible which makes it even unhealthier to choose bread over anything else. Thus make informed choices and keep a check on the amount of carbohydrates you have per meal. Is White bread suitable for weight loss? It is indeed a bad idea to choose white bread over any other wholesome meal. This is because it contains simple carbohydrates which will release energy instantly and you might feel hungry very soon. Thus increases your calorie intake drastically. Also the fiber content is negligible which again turns out to be a reason to not choose white bread. In fact regular consumption of white bread will make you feel constipated because of no fiber content in it. Hence there is no feeling of fullness post having a meal rich in refined flour and your appetite will increase ultimately. You can replace your white bread with whole wheat bread which is still better. Choose wisely when it comes to white bread and strictly have it occasionally.